The Public and Commercial Services Union has around 270,000 members and is the largest Civil Service trade union in the UK. Situated in an old building near Clapham Junction station, the headquarters of the PCS was in need of a number of interior refurbishments, including the installation of a modern conferencing system to service the needs of its National Executive Committee. 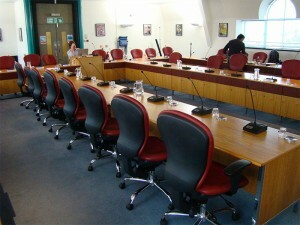 The project saw the first UK installation of beyerdynamic's Quinta wireless conference system. Vastly experienced and highly regarded installers RG Jones Sound Engineering were commissioned alongside POLARaudio to supply a modern conferencing system to replace the out-dated analogue system that was in situ. The client required the capacity to cater for up to 49 microphone units. The upgrade came in the form of a wireless solution, employing beyerdynamic's Quinta system. Quinta met all the requirements for safety, reliability and transmission security. For safe wireless transmission there are three frequency bands available - 2.4/ 5.2 and 5.8GHz. Where interference is detected Quinta can silently, seamlessly and automatically switch to an interference-free frequency range. The system has a high level of wireless encryption to protect against unauthorised listening (128-bit encryption and a 24-bit PIN-code) and in offering user-friendly operation and practical portability Quinta was the stand-out choice. 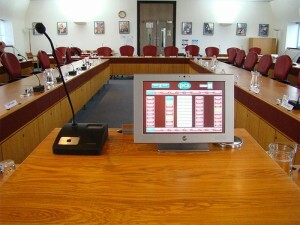 The system runs in a 'request-to-speak' mode, allowing the chairperson to control the 'request to speak' list via a CUE media control system and, specifically, a TouchCUE 12 12" touch panel (on-table type). The advantage of this control system is that it allows the user-interface to be customised to fit the specific needs of the client. The system, with remote antenna, could easily be removed from the facility should the need arise either for a change of use in the room or conferencing at an alternative location. Set up and take down time is very short and the rugged storage and transport case also acts as a charging unit with a maximum time of 2.5 hours to simultaneously charge 10 microphones. Jeff Woodford of RG Jones observed that: "The PCS Union contacted RG Jones to update their now outdated conference system that we installed 20+ years ago. I contacted Polar Audio to specify the components for a beyerdynamic system and based on the PCS Unions requirements and they recommended the new Quinta wireless system. We demonstrated it to the client and they were immediately impressed with the quality and design of the microphone units and how easy it was to set up, pack down, charge and transport the system. 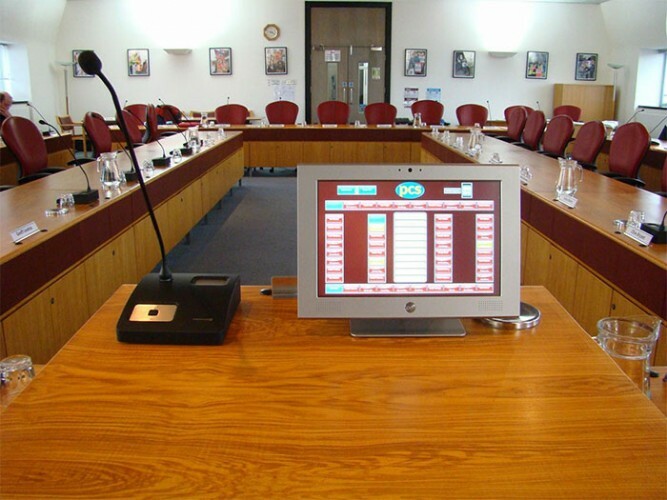 The PCS now have their new Quinta wireless conference system that incorporates a CUE touch screen for the President to control their meetings and it is proving a worthwhile modern investment." Mark Bromfield, business development manager at POLARaudio agreed: "Quinta was exceptional in meeting the needs of the client. Whilst offering the high level of sophisticated technology necessary for the security of sensitive information, the system also needed to be flexible and easy to use. The portability and ease of set-up made it ideal for outreach sessions as required by the client, saving time and obviating the need for technical expertise. This was the first installation of the Quinta system in the UK and it has been fantastically well-received by the client. Sophistication meets user-friendliness at its best!"